Bene beach is located on the north-east part of Marjan hill. Partly a sand beach its located in the centre of Marjan and surrounded by pine trees. The main reason why it is beloved by locals is the fact it has a lot of shade. Those who don’t feel like standing in the sun the entire time have a place to escape and cool themselves while still being close to our beautiful Adriatic Sea. There are additional things to do on Bene beach, like playing tennis or football. There are even spaces equipped for children where they can play with their friends. Another very important and welcome addition is that it has a special part made for people with disabilities, which is fairly new and very well made. On the southwest part of Marjan hill you can get a beautiful view of the beach underneath. That beach is called Kasjuni. It is also very popular with locals, especially with youngsters. It does not have as much shade as Bene but it is fairly big and the sea is very clean and beautiful. It is covered in small pebbles so it is accessible to everyone. It also has a number of restaurants and bars opened during summer. let’s go to Bačvice is an official hymn dedicated to the beach itself which was opened in 1919. 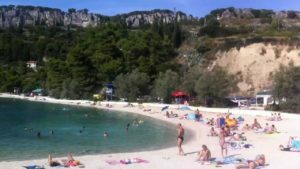 It is considered the most popular beach to go to in Split since it is in the center of the city and it is fairly easy to get to it. During summer’s ebb-tides it is most known for being a place where you go and play picigin, a game very popular with Split people. You should definitely try it and maybe play a few games with locals! Once you get good at it, it gets really fun. During evening hours clubs open so it becomes a very good place to spend your evening time with friends. Beach Žnjan is located at the far west on the coast. It became popular in 1998 when Pope Pope John Paul II passed through it. Since then, it became a place where people go to relax at the beaches (yes, there is more than one beach at Žnjan), it is filled with bars and restaurants so everyone can find something they like. From the chill out zones where you can sip your morning coffee and enjoy the sun on the deck chairs to places where you can sip cocktails while listening to popular tunes from morning to the late night. 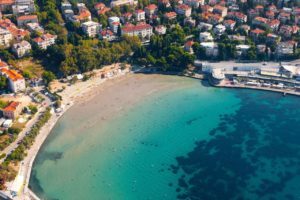 So this concludes our quick list of the best beaches in Split, we hope you will find something for yourselves and that you will enjoy your time while visiting our beautiful city.